Sometimes a frame doesn't need a picture or mirror in it, but can be left empty in a grouping with other frames. I usually have a stash of frames that I pick up here and there and when I was going through them to see which ones I want to sell at the Junk Salvation Show that is coming up in a little over a week, these three looked so good together that I wanted to find a place for them in my own home. I decided to place them on the mantel in my bedroom and move the Madonna and child print into my office for now. Enjoy! 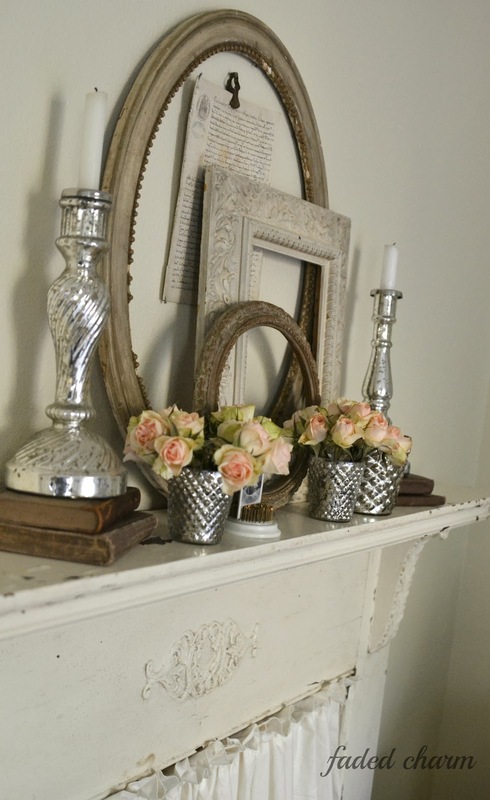 xoxo K.
Mixed with books, french paper and some of my mercury glass candlesticks and votives filled with roses, these frames give the texture that is needed. The roses were from the same bunch I had bought last week for the trophies on my mantel in the living room. After I took these photos I hung them upside down from these hooks to dry for further use. I like how the mantel is visible through the mirror on my dresser. French paper hanging behind the grouping of frames adds interest to this vignette. 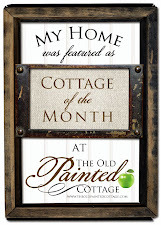 I want to thank Kris over at Junk Chic Cottage for featuring me on her blog last Saturday and I also want to thank all who left such lovely comments about me, my home and family. 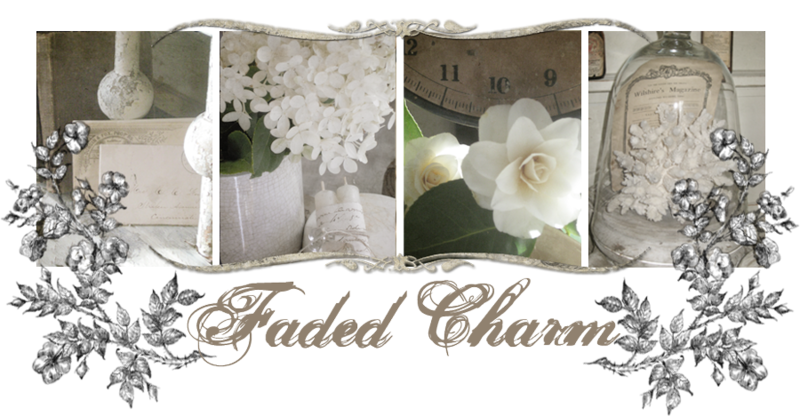 I love your blog and Facebook page and always enjoy seeing what you'll create next! I've just started collecting vintage frames to make a wall grouping. Just curious since I'm sure there's no one way, do you have any helpful tips for choosing frames or accessories to mix & match while still blending overall style? What a gorgeous vignette, Kathleen. 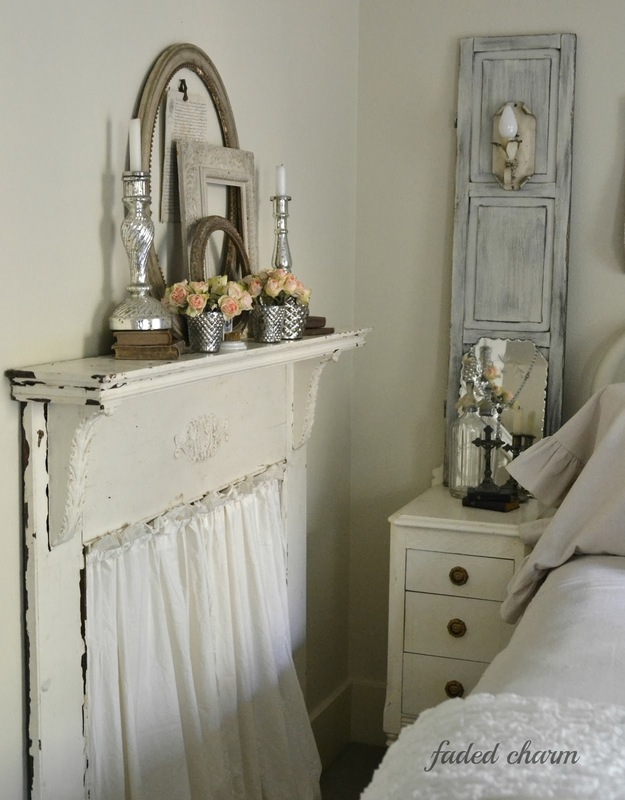 Love the shot with the mantel showing in the mirror, too! Love the layering of the frames. This gave me a great idea! As always, I love it ALL!! You are so welcome. It was a fun feature you did for Spotlight. We all truly enjoyed getting to know you better and to meet your lovely family. Love those frames on the mantel. Beautiful frames, Kathleen! I don't think I could part with them. I love the shapes mixed together and the varying sizes makes it easy to appreciate all of them. So simple....but so beautiful. Thank you for the inspiration! 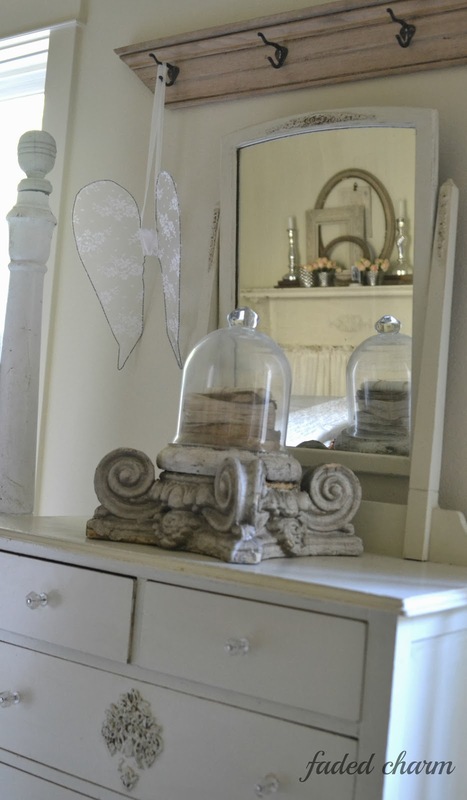 This encourages me to use some of my gorgeous old frames in a vignette. They are just standing behind furniture out of site. I do just that, stack frames empty here and there, then I pull from them for projects. It's always exciting to see what your posting here. Beautiful February inspiration we will all look forward to seeing. Love and charme in these pictures. Truly inspiring! I want to gut the house and start over after seeing this - and I have some frames in the basement to get started with! (pause) Well . . . maybe just gut a sensible corner in the living room and see what comes of it . . . Very pretty display! I just hung a few empty frames in my bathroom and I love it, too! I like how your always have the Blessed Mother in your pictures! I didn't see her today, but liked seeing Joseph and Jesus!!!!! I'm thrilled that I found your blog, it's wonderful! Your frames are glorious and your decor, truly stunning! I Love empty frames too, and the possibilities they have to be used in many ways. Thank you for the inspiration! Beautiful! Just beautiful Kathleen! Thanx for coming to THT this week. Love your frames. They have such character! I'm a new blogger who is now following. 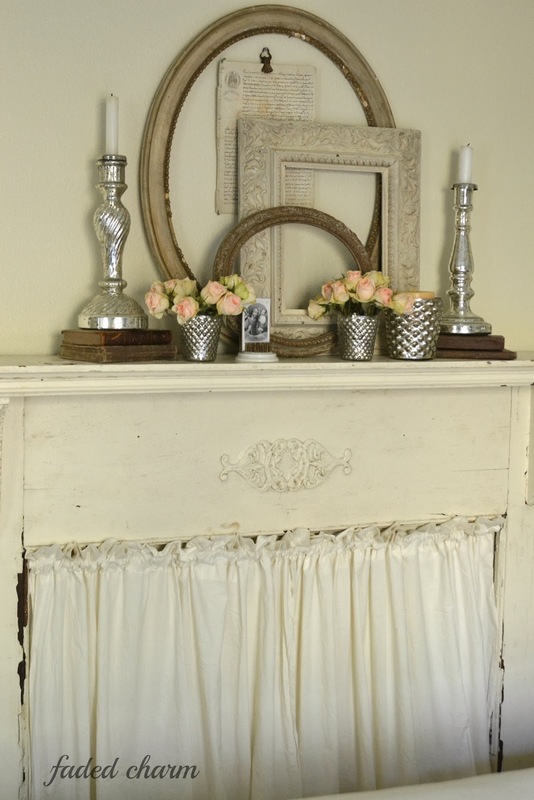 The mantle is so beautiful, the frames are stunning! I love the whole room...simply beautiful. I appreciate how you tell us how to create the same display. It really helps. I have one question, where would I find clips like the one that holds the French paper? I absolutely love your blog! I love using old frames in my decorating also. You have such a great eye. Thanks for sharing! I saw this post on the fly and had to come back! 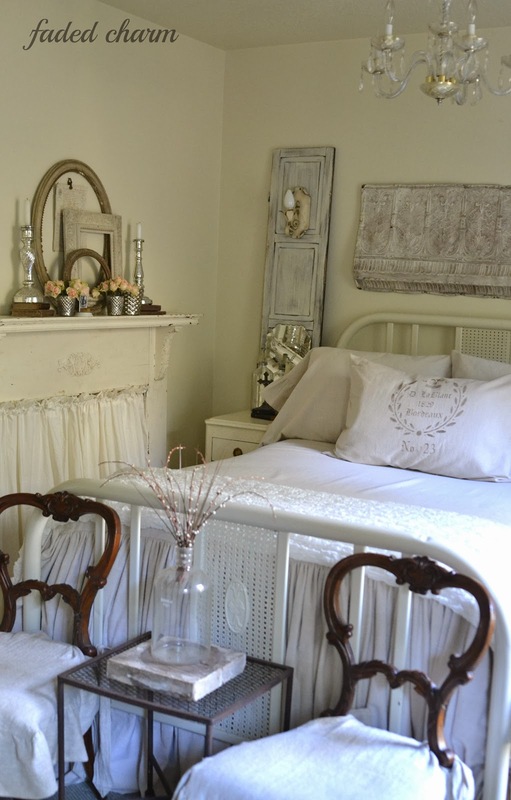 I love your oval frames, and another glimpse of this gorgeous room. 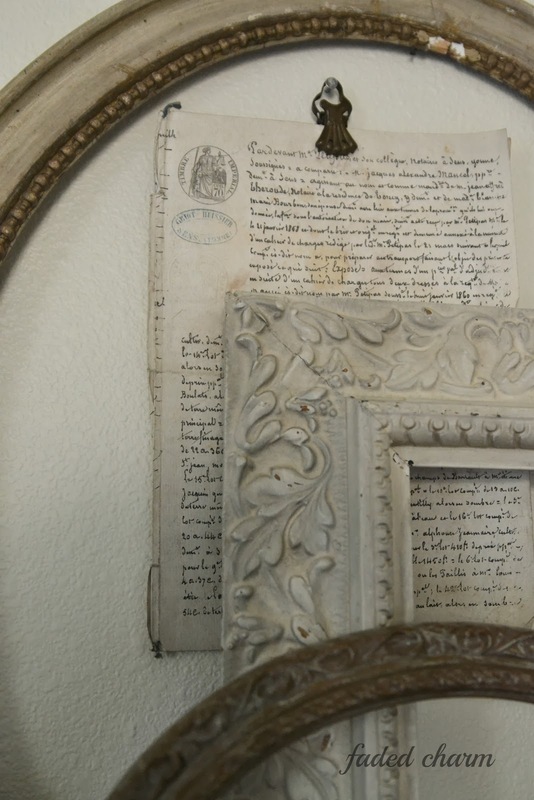 I adore the look of empty frames and I especially like the beautiful French script you have displayed here! All so lovely! Excellent job! Love how you combined and layered this. 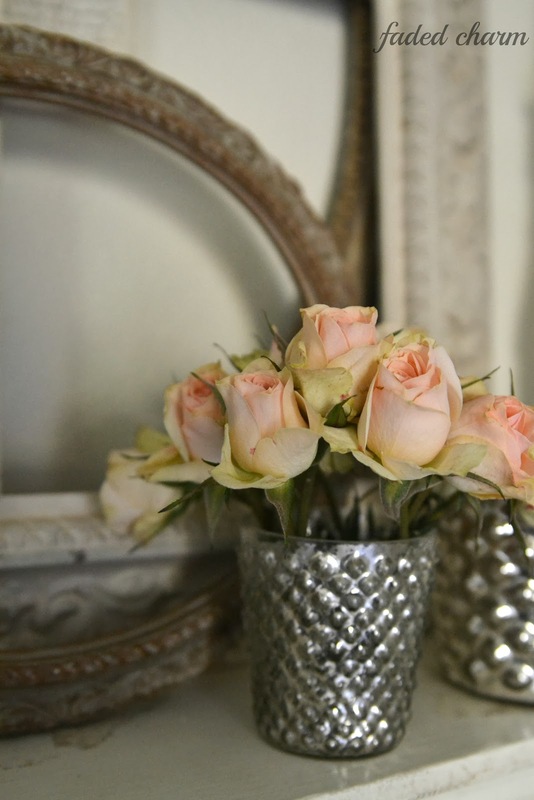 Love the addition of the roses in the mercury glass. Your bed is so nice- I like the chairs and little accent table at the end. Lots of personality in this room- love it! 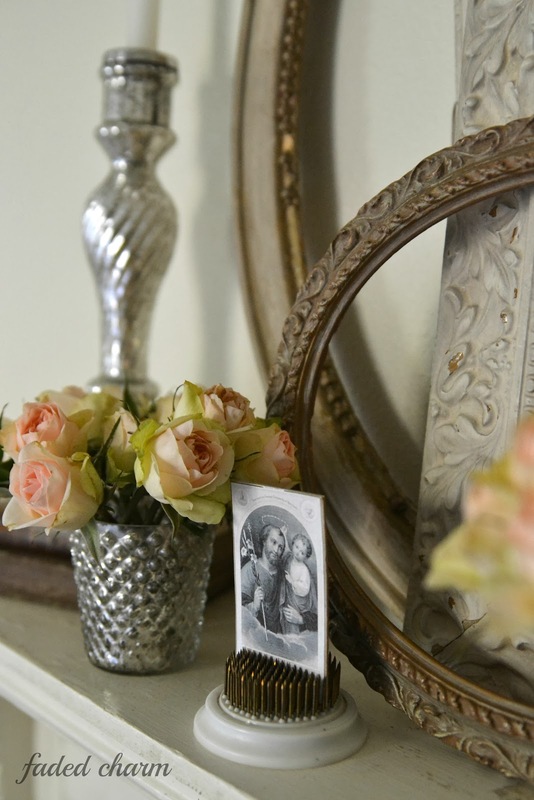 I like how vintage frames can add interest to a bare spot without being too overwhelming... if you know what I mean. Your especially love that square frame in the middle Kathleen.